I was blog-hopping when I saw an eco-friendly website “Creating a Better World” who wrote a widget on her left side bar that reads “Donate to Eco-Village: Affordable Eco-housing for Homeless and Low Income Families. I clicked the link and it diverted me to The California Institute of Earth Art and Architecture . They have a gallery of amazing Eco-Friendly homes that looks like a clay from the outside/exterior but when you see the inside/interior. It was fantastic and amazing! I was really fascinated by this. 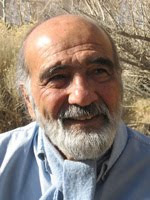 The world-renowned architect was Nader Khalili who is a humanitarian at the same time. Nader was an Iranian born citizen with 9 children. He was inspired by a Persian language poet concerning humanity and these elements, “Earth, Water, Air and Fire”. He used these elements to build Super Adobe/Ceramic Houses. How does the house made? The houses are made of sandbags and barbed wires. For further information, click it here. They will not just put it there, of course they undergo studies to make it reliable and sturdy for a family to live in. He passed away at the age of 72. If you want more information about him, click it here. THANKS so much for linking to my blog and writing a post! Really appreciate it. Yes, the eco-domes are incredible, why doesn't everybody live in one? Especially perfect foe low-income families.